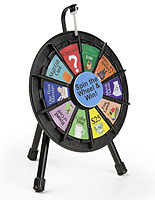 These spinning game wheels can make any function more memorable. 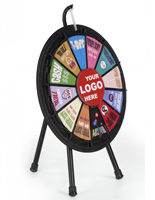 From birthday parties to tradeshows, these award wheels have an unlimited array of applications. 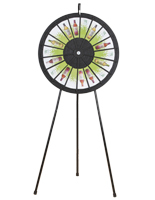 These game wheels stand six feet tall with legs attached and have a diameter of 31". 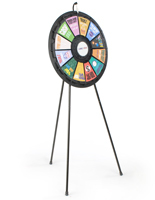 Our freestanding prize wheels, sometimes called Wheels of Fortune, can also be used as a tabletop game wheel by removing lower extensions in the legs and placing the rubber feet on the tripod stand. 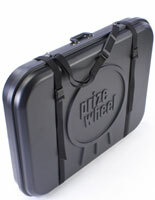 The wheel itself is made of lightweight ABS plastic while the legs are high quality powder coated steel. 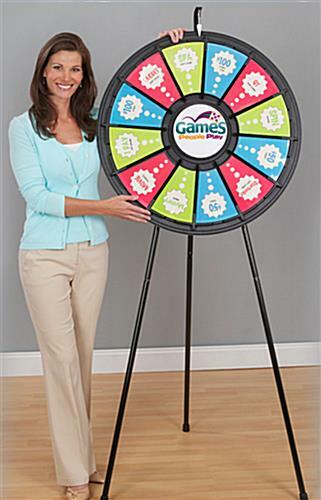 These game wheels are only 14 lbs and can be easily taken apart and moved. 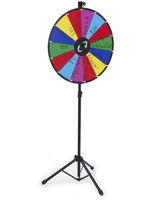 When not in use, these promotion displays can be stored by removing the lower leg extensions, lifting the latch in the back that separates the back leg from the front two and moving the back leg of the tripod forward. 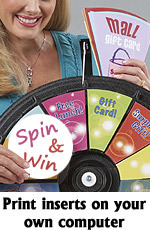 Each prize wheel has 12 slots for inserts allowing you to have a wide array of reward options. 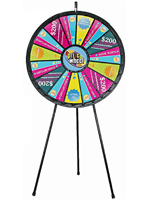 With promotional clicker wheels such as these prize wheels, you can determine your own prizes and create your own inserts on any computer. 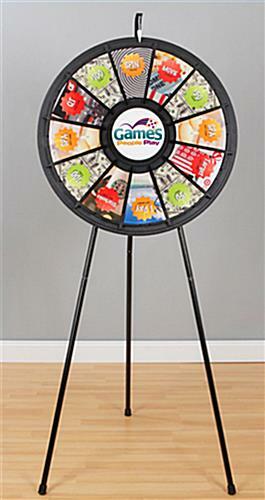 We provide these game wheels with templates. 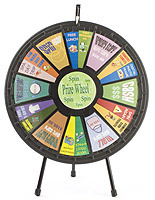 You can produce inserts in Microsoft® Word or Adobe® Illustrator®. 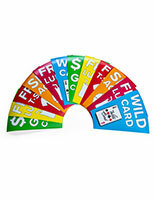 You can also add your own logo or any other images you like to the center plate. 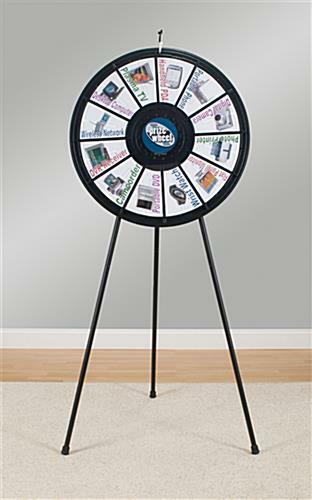 31.0" x 73.5" x 33.5"
Prize Wheel with 12 Slots & Printable Templates, Countertop or Floor Standing This prize wheel and carrying case is quality! So simple to assemble and very nice looking, not cheap at all. The professional templates are so polished and professional looking - they represent our company at trade shows in a very polished manner. So happy with the entire order that we received so quickly too.